1966 SHELBY COBRA 427 V8 REPLICA TITLE AS A 1972 MUSTANG HAS PARTIAL MUSTANG SUSPENSION CUSTOM BUILT FRAME THE BODY KIT ALL FIBERGLASS BODY CUSTOM BLUE PAINT BELIEVE IS STREET BEAST OUT OF SOUTH FLORIDA BUT NOT 100 PERCENT POSITIVE GENUINE 427 HIGH PERFORMANCE SINGLE 4 BARREL DOUBLE PUMPER CUSTOM BUILT 600 FORD AUTOMATIC TRANSMISSION WITH 8.8 DETROIT LOCKER BELIEVED TO BE 355 GEAR RATIO. 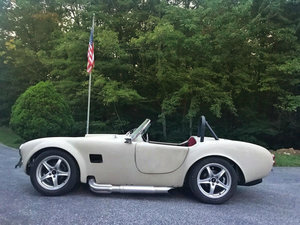 WILWOOD DISC BRAKES ON ALL FOUR CORNERS ALUMINUM RADIATOR WITH ELECTRIC FAN CUSTOM CHROME COBRA WHEELS REAR THOMPSON STREET SLICKS ON THE REAR. THIS CAR IS BEING SOLD FROM A GENTLEMAN\' S COLLECTION WHO IS THINNING THE HERD. Please Note The Following **Vehicle Location is at our clients home and Not In Cadillac, Michigan. **We do have a showroom with about 25 cars that is by appointment only **Please Call First and talk to one of our reps at 231-468-2809 EXT 1 ** FREE Consignment Visit Our Site Today Easy To List Your Vehicle and Get it Sold in Record Time.